Challenging old and outdated perceptions that feminine traits are weaknesses, The Feminine Revolution revisits those characteristics to show how they are powerful assets that should be embraced rather than maligned. It argues that feminine traits have been mischaracterized as weak, fragile, diminutive, and embittered for too long, and offers a call to arms to redeem them as the superpowers and gifts that they are. Take things hard. Women feel things deeply, especially the hard stuff--and that's a good thing. Enjoy glamour. Peacocks' bright coloring and garish feathers are part of their survival strategy--similar tactics are part of our happiness strategy. Chit-chat. Women have been derogated for "gossip" for centuries. But what others call gossip, we call social connection. Emote. Never let anyone tell you to not be emotional. Express your enthusiasm, love, affection and warmth. Embrace your domestic side. Don't be ashamed to cultivate the beauty of your home and wrap your arms around friends and family. With an upbeat blend of self-help and fresh analysis, The Feminine Revolution reboots femininity for the modern woman and provides her with the tools to accept and embrace her own authentic nature. Amy Stanton is a long-time marketer and brand-builder currently running a marketing and PR agency with a large focus on brands targeted at and built by women. Previously, she was the CMO of Martha Stewart Living Omnimedia. She is a frequent speaker on the topics of women, sports, branding, and entrepreneurship. She lives in Venice, California. Catherine Connors is the co-founder and CCO of Maverick, a network for girls and young women. She's the former Editor in Chief of Babble and head of content for Disney Interactive's Women and Family portfolio. She has been featured in media like The New York Times, CNN, NPR, and Good Morning America. She lives in Los Angeles. Gabby Reece is a world-renowned athlete, New York Times bestselling author, fitness entrepreneur, national speaker, Nike's first female spokeswoman, and mother of daughters. She lives in Malibu. "I'd love for my daughter to grow up in a world where then men and women in her life support her and in which she won't have to sacrifice her femininity for the expense of her success. 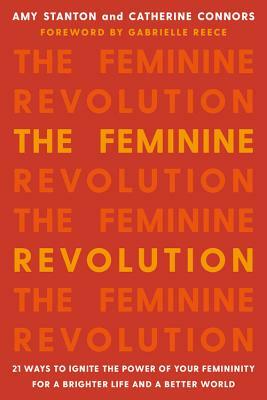 The Feminine Revolution is a beautiful exploration of that idea and can help lay the groundwork for that future." "This new book recasts female attributes in an empowering light." "The Feminine Revolution [shows us how to] reclaim the true power of "feminine" traits like emotional attunement and social connection." "Authors Amy Stanton and Catherine Connors share the history behind why values linked to femininity may have been considered "weak," and illustrate why these traits today can be your leadership superpowers." "The Feminine Revolution is the antidote to the current autoimmune epidemic and the Rx for the new feminine consciousness, health, and healing."